Fall has descended on the North Bay. The mornings are crisp, the sky is a deep blue and the ocean is groomed by offshore breezes. Grape vines are turning yellow and the crop is in. Kids are back in school and crowded weekend attractions are now the domain of appreciative locals. Fall is my favorite time of year in the North Bay hands down. But then again, the rest of year is pretty great here, too. All throughout the year, the North Bay has a lot to offer—good food, good weather, natural beauty, fine wine, and a vibrant and varied economy. 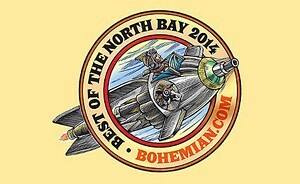 It’s hard to single out what makes the North Bay the destination it is, but each week we try. Part of my job at the Bohemian is to tell stories about the experiences, people and places that contribute to the quality of life here. We do that in a big way with our annual Best Of issue by relying on our best source for what’s new and great in the North Bay—you. 11101 Hwy. 1, Ste. 101, Pt. Reyes Station. 415.663.1347. 150 N. Main St., Sebastopol. 707.829.7200. 282 S. High St., Sebastopol. 707.829.4797. 48 Wharf Road, Bolinas. 415.868.0330. 55 President's Circle, Yountville. 707.944.0500. 425 Seventh St., Santa Rosa. 707.579.1500. 1118 Fourth St., San Rafael. 415.454.1222. 1340 Main St., St. Helena. 707.963.9779. 6868 McKinley St., Sebastopol. 707.525.4840. 551 Summerfield Road, Santa Rosa. 707.522.0719. 100 Elm St., San Rafael. 415.453.6705. 950 Pearl St., Napa. 707.255.2701. 390 Morris St., Sebastopol. 707.824.8006. 110 Howard St., Petaluma. 707.765.2660. 118 Greenfield Ave., San Anselmo. 415.454.5759. 237 Shoreline Hwy., Mill Valley. 415.388.6786. 6780 Depot St., Sebastopol. 707.823.1074. 56 W. Sixth St., Santa Rosa. 707.575.8277. 842 Fourth St., San Rafael. 415.226.0262. 1400 First St., Napa. 707.254.8888. 230 Petaluma Ave., Sebastopol. 707.829.7300. 691 Broadway Ave., Sonoma. 707.935.9100. 3535 Industrial Drive, Santa Rosa. 707.545.6150. State Route 1, Ste. 1, Pt. Reyes Station. 415.663.8068. 1124 Foster Road, Napa. 707.257.8463. 3392 Mendocino Ave., Santa Rosa. 707.528.4434. 3565 Standish Ave., Santa Rosa. 707.588.0707. PO Box 1608, Forestville. 707.887.1647. 10 Avenue of the Flags, San Rafael. 415.473.6800. 1030 Main St., Napa. 707.226.7372. 50 Mark West Springs Road, Santa Rosa. 707.546.3600. 1801 E. Cotati Ave., Rohnert Park. 866.955.6040. 890 Belle Ave., San Rafael. 415.499.4488. 52 W. Sixth St., Santa Rosa. 707.523.4185. 461 Sebastopol Ave., Santa Rosa. 707.528.7554. 19 Corte Madera Ave., Mill Valley. 415.388.1100. 1350 Third St., Napa. 707.259.0123. 23 N. Petaluma Blvd., Petaluma. 707.765.9211. 306 Sir Francis Drake Blvd., San Anselmo. 415.453.1490. 1370 Second St., Napa. 707.252.6353. 130 Fourth St., Santa Rosa. 707.542.9474. 2701 Gravenstein Hwy. S., Sebastopol. 707.823.3101. 1830 Sir Francis Drake Blvd., Fairfax. 415.459.4493. 1120 Main St., St. Helena. 707.963.7972. 971 Gravenstein Hwy. S., Sebastopol. 707.829.3312. 149 N. Main St., Sebastopol. 707.829.1138. 1831 Guerneville Road, Santa Rosa. 707.872.7296. 611 Fifth St., Santa Rosa. 707.528.1380. 1138 Fourth St., San Rafael.415.457.2787. 3250 California Blvd., Napa. 707.224.2775. 103 Maxwell Court, Santa Rosa. 707.526.2416. 156 N. Main St., Sebastopol. 707.824.4837. 1824 Sir Frances Drake Blvd., Fairfax. 415.456.8121. 1346 Trancas St., Napa. 707.226.3422. 637 Fourth St., Santa Rosa. 707.542.3599. 6671 Front St., Forestville. 707.887.8530. 15 Bolinas Road, Fairfax. 415.453.7109. 1202 Main St., Napa. 707.226.2044. 605 Fourth St., Santa Rosa. 707.579.1459. 51 Tamal Vista Blvd., Corte Madera. 415.927.0960. 3740 Bel Aire Plaza, Napa. 707.252.8002. 1330 Lincoln St., Calistoga. 707.942.1616. 140 Kentucky St., Petaluma. 707.762.0563. 775 Village Court, Santa Rosa. 707.578.8938. 138 N. Main St., Sebastopol. 707.823.2618. 306 Center St., Healdsburg. 707.433.1118. 1611 Fourth St., San Rafael. 415.482.0550. 964 Pearl St., Napa. 707.733.3199. 625 Fourth St., Santa Rosa. 707.525.1782. 1504 Fourth St., San Rafael. 415.457.7600. 2026 Redwood Road, Napa. 707.265.8275. 122 N. Main St., Sebastopol. 707.823.7664. 43 Petaluma Blvd. N., Petaluma. 707.765.6807. 894 Fourth St., San Rafael. 415.457.8999. 1899 Mendocino Ave., Santa Rosa. 707.525.1963. 11101 Hwy. 1, Pt. Reyes Station. 415.663.1936. 1317 Napa Town Center, Napa. 707.224.0997. 146 N. Main St., Sebastopol. 707.829.3036. 638 Fourth St., Santa Rosa. 707.657.4004. 1604 Fourth St., San Rafael. 415.456.1211. 1305 First St., Napa. 707.257.1363. 100 Fourth St., Santa Rosa. 707.546.9276. 3598 Gravenstein Hwy., Sebastopol. .707.827.3618. 211 Corte Madera Town Center, Corte Madera. 415.924.1715. 1223 Main St., St Helena. 707.963.1603. 315 D St., Santa Rosa. 707.528.0182. 150 Kentucky St., Petaluma. 707.765.1715. 80 Fourth St., Pt. Reyes Station. 415.663.8057. 1128 First St., Napa. 707.251.9058. 711 Fourth St., Santa Rosa. 707.526.4766. 145 N. Main St., Sebastopol. 707.829.8757. 224 Greenfield Ave. #3, San Anselmo. 415.453.6191. 1210 First St., Napa. 707.224.3162. 755 Petaluma Ave., Sebastopol. 707.827.3460. 101 Third St., Santa Rosa. 707.528.7247. 184 Bon Air Center, Greenbrae. 415.419.8130. 5800 Northgate Mall, San Rafael. 415.472.1202. 1209 First St., Napa. 707.252.7280. 710 Farmers Lane, Santa Rosa. 707.571.8643. 2411 Magowan Drive, Santa Rosa. 707.542.1690. 176 N. Main St., Sebastopol. 707.634.7401. 11 E. Napa St., Sonoma. 707.931.0357. 500 W. Napa St., Sonoma. 707.933.1702. 2255 Cleveland Ave., Santa Rosa. 707.546.1083. 2158 Fourth St., San Rafael. 415.454.2021. 2555 Main St., St. Helena. 707.967.1100. 422 Wilson St., Santa Rosa. 707.545.1195. 1801 Piner Road, Santa Rosa. 707.546.3749. 831 B St., San Rafael. 415.456.3939. 2977 Solano Ave., Napa. 707.252.8015. 529 Fourth St., Santa Rosa. 707.568.4044. 707 Fifth St., Santa Rosa. 707.542.1855. 1535 S. Novato Ave., Novato. 415.892.1577. 1450 Lincoln Ave., Calistoga. 707.942.4396. 4055 Santa Rosa Ave., Santa Rosa. 707.584.7811. 1360 Broadway Ave., Sonoma. 707.939.8811. 660 Gravenstein Hwy. N., Sebastopol. 707.823.7688. 3060 Kerner Blvd., San Rafael. 415.458.5870. 400 Morris St., Sebastopol. 707.829.8282. 716 College Ave., Santa Rosa. 707.272.8136. 115 Jordan St., San Rafael. 415.485.2213. 244 & 254 Shoreline Hwy., Mill Valley. 415.380.8900. 815 Main St., Napa. 707.927.3623. 6790 McKinley St., Ste 130, Sebastopol. 707.634.7129. 6988 McKinley St., Sebastopol. 707.829.1181. 445 Francisco Blvd. E., San Rafael. 415.456.7071. 466 & 583 Soscol Ave., Napa. 707.927.4466. 2875 Corby Ave., Santa Rosa. 800.225.3055. 445 Francisco Blvd. East., San Rafael. 415.456.7071. 784 Soscol Ave., Napa. 707.257.1565. 137 Front St., San Rafael. 415.456.3345. 1739 Action Ave., Napa. 707.251.9622. 7601 Redwood Drive, Cotati. 707.793.9180. 3383 Airway Drive, Santa Rosa. 707.578.6686. 518 College Ave., Santa Rosa. 707.523.2371. 326 Petaluma Blvd. N., Petaluma. 707.763.4658. 990 Francisco Blvd. E., San Rafael. 415.454.5660. 1538 Third St., Napa. 707.252.8366. 2460 Santa Rosa Ave., Santa Rosa. 707.876.7434. 1945 Cleveland Ave., Santa Rosa. 707.579.3710. 46 Hamilton Drive, Novato. 415.883.4448. 17320 Yajome St., Napa. 707.252.6567. 321 Second St., Petaluma. 707.769.0162. 501 Barham Ave., Santa Rosa. 707.545.7076. 130 Sir Francis Drake Blvd., San Anselmo. 415.453.2701. 1805 Pueblo Ave., Napa. 707.255.8400. 3244 Gravenstein Hwy. N., Sebastopol. 707.823.9125. 1212 13th St., Santa Rosa. 707.542.4782. 55 Frosty Lane, Novato. 415.233.4104. 721 Francisco Blvd. E., San Rafael. 415.482.8802. 55 Enterprise Court, Ste. 2, Napa. 707.254.0200. 4880 Sonoma Hwy., Santa Rosa. 707.595.1340. 4130 S. Moorland Ave., Santa Rosa. 707.584.9370. 13 W. Third St., Santa Rosa. 707.542.3866. 5665 Redwood Drive, Rohnert Park. 707.584.2384. 6731 Sebastopol Ave., Sebastopol. 707.829.1510. 720 Center Blvd., Fairfax. 415.454.0123. 3385 Solono Ave., Napa. 707.253.2621. 546 E. Cotati Ave., Cotati. 707.950.9501. 560 Montecito Center, Santa Rosa. 707.537.7123. 461 Stony Point Road, Santa Rosa. 707.284.3530. 1899 Mendocino Ave., Santa Rosa. 707.546.1806. 6762 Sebastopol Ave. #100, Sebastopol. 707.407.4020. 330 Bellam Blvd., San Rafael. 415.578.3971. 2434 Jefferson St., Napa. 707.255.9068. 2481 Guerneville Road, Santa Rosa. 707.542.3513. 1621 W. Imola Ave., Napa. 707.224.3117. 59 Throckmorton Ave., Mill Valley. 415.380.9200. 1350 Main St., Napa. 707.226.2132. 186 N. Main St., Sebastopol. 707.824.1400. 120 Kentucky Ave., Petaluma. 707.762.9611. 1099 Fourth St. #G, San Rafael. 415.457.2420. 110 Soscol Ave., Napa. 707.226.7420. 622 Santa Rosa Ave., Santa Rosa. 707.541.7016. 8492 Gravenstein Hwy., Ste. C, Cotati. 707.795.6420. 3372 Santa Rosa Ave., Santa Rosa. 707.545.4975. 16 Western Ave., Petaluma. 707.762.9420. 447 Miller Ave., Mill Valley. 415.381.4247. 920 Franklin St., Napa. 707.258.8537. 122 Fourth St., Santa Rosa. 707.575.5123. 322 Healdsburg Ave., Healdsburg. 707.431.1400. 963 Grand Ave., San Rafael. 415.454.9662. 1415 Second St., Napa. 707.224.4599. 2330 Midway Drive, Santa Rosa. 707.545.5341. 410 Petaluma Blvd. S., Petaluma. 707.778.8959. 800 Redwood Hwy., Ste. 216, Mill Valley. 415.383.3223. 1401 Lincoln Ave., Napa. 707.738.9511. 186 N. Main St. #230, Sebastopol. 707.861.3434. 1311 W. Steele Lane, Ste. B, Santa Rosa. 707.591.6732. 1006 Lincoln Ave., San Rafael. 415.460.6979. 926 Franklin St., Napa. 707.266.2454. 313 Main St., Sebastopol. 707.829.7256. 600 Mendocino Ave., Santa Rosa. 707.566.9955. 755 Silverado Trail, Calistoga. 707.226.0800. 209 Bohemian Hwy., Freestone. 707.823.8231. 6526 Yount St., Yountville. 707.204.6000. 25 Matheson St., Healdsburg. 707.431.2800. 7075 Redwood Blvd., Ste. H, Novato. 415.250.4009. 1834 First St., Napa. 707.260.4794. 633 Fourth St., Santa Rosa. 707.575.4826. 876 Gravenstein Hwy. S., Sebastopol. 707.823.2217. 3091 Solano Ave., Napa. 707.255.5152. 95 Montgomery Drive, Ste. 90, Santa Rosa. 707.528.4372. 186 N. Main St., Sebastopol. 707.823.8818. 6771 Sebastopol Ave., Sebastopol. 707.823.4206. 1061 N. Dutton Ave., Santa Rosa. 707.843.3227. 1050 Northgate Drive, Ste. 1, San Rafael. 415.491.0959. Ryan Lazarus, Lazarus Chiropractic Inc.
1734 Jefferson St., Napa. 707.224.2283. 1819 Fourth St., Santa Rosa. 707.523.9850. 635 Fifth St., Santa Rosa. 707.575.8988. 7250 Redwood Blvd. #107, Novato. 415.878.0240. 3303 Villa Lane, Napa. 707.254.0404. 2245 Montgomery Drive, Santa Rosa. 707.575.0600. 3835 Cypress Drive, Ste. 210, Petaluma. 707.559.2166. 8741 Brooks Road S., Windsor. 707.836.8360. 301 Washington St., Petaluma. 707.762.0211. 7 N. Knoll Road, Mill Valley. 415.388.5151. 1103 Trancas St., Napa. 707.255.1172. 98 Montgomery Drive, Santa Rosa. 707.579.1555. 3910 Princeton Drive, Santa Rosa. 707.546.9882. 250 Bon Air Road, Greenbrae. 415.925.7000. 10 Woodland Road, St. Helena. 707.963.3611. 401 Bicentennial Way, Santa Rosa. 707.393.4000. 3325 Chanate Road, Santa Rosa. 707.576.4000. 1127 Fourth St., San Rafael. 415.453.2020. 1328 Pearl St., Napa. 707.254.2020. 534 Larkfield Center, Santa Rosa. 707.578.2020. 1430 Guerneville Road, Ste. 3, Santa Rosa. 707.525.9920. 350 Bon Air Road #120, Greenbrae. 415.482.3888. 70 Stony Point Road, Santa Rosa. 707.542.8346. 1002 Mendocino Ave., Santa Rosa. 707.577.8292. 350 Bon Air Road, Ste. 1, Greenbrae. 415.924.1313. 1175 Trancas St., Napa. 707.258.6053. 1128 Sonoma Ave., Santa Rosa. 707.575.1626. 1101 Fourth St., San Rafael. 415.485.2265. 2007 Redwood Road, Ste. 101, Napa. 707.257.7777. 500 Bicentennial Way, Santa Rosa. 707.568.6100. 209 Third St., San Rafael. 800.479.7928. 1010 Grant Ave., Novato. 800.479.7928. 1705 First St., Napa. 707.545.4000. 1205 N. Dutton Ave., Santa Rosa. 707.545.4000. 2763 Fourth St., Santa Rosa. 707.545.4000. 2360 Mendocino Ave., Santa Rosa. 707.545.4000. 780 Trancas St., Napa. 707.256.2147. 1057 College Ave., Santa Rosa. 707.577.7777. 1401 Fourth St., Santa Rosa. 707.280.4772. 12783 Sir Frances Drake Blvd., Inverness. 415.669.1685. 1436 Second St., Napa. 707.418.5118. 415 Russell Ave., Santa Rosa. 707.575.1040. 7770 Healdsburg Ave., Sebastopol. 707.829.0215. 80 Fourth St., Pt. Reyes Station. 415.663.9335. 651 Main St., St. Helena. 707.963.5010. 5566 Gravenstein Hwy. N., Forestville. 800.473.2767. 4515 Ross Road, Sebastopol. 800.543.4372. 7351 Bodega Ave., Sebastopol. 707.829.5833. 1049 Fourth St., Ste. B, Santa Rosa. 800.985.9322. 5150 Commerce Blvd., Rohnert Park. 707.595.0450. 2500 Jefferson St., Napa. 707.253.2453. 512 Mendocino Ave., Santa Rosa. 707.546.8735. 111 Fifth St., Santa Rosa. 707.542.6359. 1500 Los Gamos Drive, San Rafael. 415.492.YMCA. 3175 California Blvd., Napa. 707.254.7200. 515 Fifth St., Santa Rosa. 707.284.4664. 220 Corte Madera Town Center, Corte Madera 415.945.3000. 1200 N. Dutton Ave., Santa Rosa. 707.578.1640. 1769 Grant Ave., Novato. 415.898.3499. 545 Ross St., Santa Rosa. 707.526.3100. 132 Weeks Way, Sebastopol. 707.829.8746. 438 Miller Ave., Mill Valley. 415.381.3724. 1701 Fourth St., San Rafael. 415.306.7904. 1950 Jefferson St., Napa. 707.254.9545. 622 Lindaro St., San Rafael. 415.413.0930. 2000 W. Pueblo Ave., Napa. 707.255.5470. 880 Piner Road, Santa Rosa. 707.571.2013. 575 Summerfield Road, Santa Rosa. 707.538.2950. 630 Summerfield Road, Santa Rosa. 707.543.3425. 5585 Newanga Ave., Santa Rosa. 707.539.8092. 310 Smith Ranch Road, San Rafael. 415.492.1800. 2295 Streblow Drive, Napa. 707.255.4333. 3330 Yulupa Ave., Santa Rosa. 707.528.3673. 1340 19th Hole Drive, Windsor. 707.838.7888. 1240 Mendocino Ave., Santa Rosa. 707.546.0660. 11101 Hwy. 1, Pt. Reyes Station. 415.663.1072. 17191 Bodega Hwy., Bodega. 707.876.3032. Civic Center Drive, San Rafael. 415.472.6100. 500 First St., Napa. 707.501.3087. 50 Mark West Springs Road, Santa Rosa. 707.522.8629. 3571 Old Adobe Road, Petaluma. 707.778.7500. 11312 Hwy. 1, Pt. Reyes Station. 415.663.9420. 1357 Main St., St. Helena. 707.819.8192. 1409 Bohemian Hwy., Freestone. 707.874.2938. 5000 Northgate Mall, San Rafael. 415.479.7200. 1755 Industrial Way, Napa. 707.363.3447. 6811 Laguna Park Way, Sebastopol. 707.575.3277. 3448 Santa Rosa Ave., Santa Rosa. 707.585.2616. 2202 Fourth St., San Rafael. 415.456.0866. 933 Main St., Napa. 707.963.3486. 644 First St., Napa. 707.224.6900. 1501 Fourth St., Santa Rosa. 707.546.4016. 10070 Main St., Penngrove. 707.665.9790. 4910 Sonoma Hwy., Santa Rosa. 707.538.4000. 1774 Piner Road., Santa Rosa. 707.521.0890. 45 Broadway Blvd., Fairfax. 415.453.7472. 610 First St., Napa. 707.257.4992. 1880 Mendocino Ave., Santa Rosa. 707.528.3278. 151 Petaluma Blvd., Petaluma. 707.772.5177. 417 Miller Ave., Mill Valley. 415.388.2636. 670 Main St., Napa. 707.265.0265. 1224 Mendocino Ave., Santa Rosa. 707.576.0737. 310 Bon Air Center, Greenbrae. 415.461.2253. 3816 Bel Aire Plaza, Napa. 707.240.4004. 381 Healdsburg Ave., Healdsburg. 707.395.4111. 7582 Commerce Blvd., Cotati. 707.792.1681. 401 Kenilworth Drive #920, Petaluma. 707.200.2202. 879 Grant Ave., Novato. 415.898.6160. 151 Petaluma Blvd., Petaluma. 707.765.9866. 110 Petaluma Blvd. N., Petaluma. 707.778.9888. 3401 Cleveland Ave. Ste. 9, Santa Rosa. 707.843.3551. 800 Grant Ave., Novato. 415.897.9500. 610 First St., Napa. 707.253.1190. 324 Center St., Healdsburg. 707.433.9081. 6790 McKinely St., Ste. 170, Sebastopol. 707.634.7129. 848 College Ave., Kentfield. 415.459.0291. 3611 Bohemian Hwy., Occidental. 707.874.2838. 404 Santa Rosa Ave., Santa Rosa. 707.573.5955. 1422 Fourth St., Santa Rosa. 707.545.2233. 540 Main St. #100, Napa. 707.259.0762. 60 Fourth St., Pt. Reyes Station. 415.663.1536. 2297 Jefferson St., Napa. 707.255.6700. 125 Keller St., Petaluma. 707.773.1143. 1916 Sir Francis Drake Blvd., Fairfax. 415.456.3580. 1780 Mendocino Ave., Santa Rosa. 707.293.9814. 630 Fourth St., Santa Rosa. 707.6545.3785. 540 Main St., Napa. 707.252.8115. 300 Via Archimedes, Geyserville. 707.857.1485. 330 Healdsburg Ave., Healdsburg. 707.395.4640. 901 & 903 Lincoln Ave., San Rafael. 415.451.4765. 811 Fourth St., San Rafael. 415.451.4765. 401 Miller Ave., Mill Valley. 415.380.1986. 610 Main St., Napa. 707.252.1600. 1001 Second St., Napa. 707.224.0800. 367 Bolinas Road, Fairfax. 415.456.8084. 2766 Old Sonoma Road, Napa. 707.927.5070. 416 East D St., Petaluma. 707.769.7208. 848 B. St. , San Rafael. 415.454.5551. Alan Luzmoor, John Ash & Co.
901 A St., San Rafael. 415.454.8080. 1314 McKinstry St., Napa. 707.257.5157. 6770 McKinley St., Sebastopol. 707.523.4814. 521 Adams St., Santa Rosa. 707.546.5100. 123 Bolinas St., Fairfax. 415.488.5123. 1313 Main St., Napa. 707.258.1313. 500 Main St., Napa. 707.254.9690. 12781 Sir Francis Drake, Inverness. 415.669.1244. 6780 Depot St., Sebastopol. 707.823.3144. 523 Fourth St., Santa Rosa. 707.526.5787. 120 Vintage Way, Novato. 415.892.8838. 2940 Jefferson St., Napa. 707.226.8881. 2700 Yulupa Ave., Ste. 3, Santa Rosa. 707.525.1957. 620 Fifth St., Santa Rosa. 707.546.2929. 3883 Airway Drive #145, Santa Rosa. 707.528.3095. 704 Fourth St., San Rafael. 415.456.5808. 376 Soscol Ave., Napa. 707.251.3840. 52 Mission Circle, Santa Rosa. 707.538.3367. 35 Broadway Blvd., Fairfax. 415.459.1618. 1425 First St., Napa. 707.252.1022. 75 Montgomery Drive, Santa Rosa. 707.579.2682. 107 Caledonia St., Sausalito. 415.332.3620. 2446 Patio Court, Santa Rosa. 707.542.8282. 1480 First St., Napa. 707.255.5599. 1 Vivian St., San Rafael. 415.456.8190. 1601 Jefferson St., Napa. 707.224.9000. 800 Petaluma Blvd. N., Petaluma. 707.762.8192. 108 Kentucky St., Petaluma. 707.769.9066. 350 Harbor Drive, Sausalito. 415.331.3474. 800 Hwy. 1, Bodega Bay. 707.875.3652. 1230 Fourth St., San Rafael. 415.456.4455. 1408 Clay St., Napa. 707.226.8884. 525 Fourth St. #2, Santa Rosa. 707.526.3939. 720 B St., San Rafael. 415.453.3505. 976 Pearl St., Napa. 707.255.5417. 966 N. Dutton Ave., Santa Rosa. 707.566.8910. 1965 Mendocino Ave., Santa Rosa. 707.523.3888. 923 C St., San Rafael. 415.686.3442. 1899 Mendocino Ave., Santa Rosa. 707.544.2491. 1435 N. McDowell Blvd., Petaluma. 707.792.5300. 848 B St., San Rafael. 415.454.5551. Chrysti Kehr, John Ash & Co.
1533 Fourth St., San Rafael. 415.456.1011. 1401 First St., Napa. 707.258.1516. 823 Main St., Napa. 707.257.3008. 3320 Mendocino Ave., Santa Rosa. 707.546.1958. 434 College Ave., Santa Rosa. 707.542.2550. 724 B St., San Rafael. 415.453.4318. 1374 Lincoln Ave., Calistoga. 707.942.2233. 135 Fourth St., Santa Rosa. 707.545.6900. 850 Lamont Ave., Novato. 415.893.1892. 1245 Spring St., St. Helena. 707.967.8779. 15 Rowland Way, Novato. 415.898.4677. 1280 N. McDowell Blvd., Petaluma. 707.769.4495. 1 Executive Way, Napa. 707.254.7167. Pliny the Elder, Russian River Brewing Co.
4001 Spring Mountain Road, St. Helena. 707.963.9327. 679 McKinley St. #100, Sebastopol. 707.634.4793. 21877 Eighth St., Sonoma. 707.721.6390. 1026 Machin Ave., Novato. 415.899.9883. 4029 Hagan Road, Napa. 707.226.5587. 5007 Fulton Road, Fulton. 866.287.9818. 300 Via Archimedes, Geyserville. 707.857.1471. 8300 St. Helena Hwy., Rutherford. 707.963.5221. 6097 Bennett Valley Road, Santa Rosa. 707.528.6464. 235 Healdsburg Ave., Healdsburg. 800.314.1762. 11925 Hwy. 1, Pt. Reyes Station. 415.663.9122. 1400 Schramsberg Road, Calistoga. 707.942.4558. 11447 Old Redwood Hwy., Healdsburg. 707.431.5479. 4791 Dry Creek Road, Healdsburg. 707.433.0200. 24625 Chianti Road, Geyserville. 707.942.7082. 1474 Alexander Valley Road, Healdsburg. 800.654.1213. 5 Fitch St., Healdsburg. 707.433.3473. 1115 San Anselmo Ave., San Anselmo. 1001 Silverado Trail, St. Helena. 707.963.7000. 235 Healdsburg Ave., Healdsburg. 707.525.6244. 700 Grove St., Healdsburg. 707.433.3579. 3354 Coffey Lane, Santa Rosa. 707.575.3441.